I eat a small serving of two flapjacks as an accompaniment dish to my standard breakfast of scrambled eggs and nitrate-free bacon, not as a main meal. Double or triple the batch to share the love! Topped with real buttah. Viva la low carb! Makes 2 medium flapjacks. Serves 1. Heat a nonstick skillet to medium heat, or until a drop of water sizzles and “dances” around the skillet. You don’t have to grease it. When measuring oat or coconut flour, sift a bit of it (or whisk it until the lumps are broken up), and lightly spoon the amount called for into a tablespoon or quarter cup measure. Level off with a knife. Whisk together egg and cream, and add dry ingredients. Whisk batter very well until there are no longer lumps. Let it sit for a minute or two to thicken up. Pour or scrape batter on to skillet, and cook until bubbles appear on surface of pancake. Flip and cook other side for about 30 seconds. Serve with butter and sugar-free maple syrup, or a bit of honey, if desired. What is your favorite healthy breakfast? Leave a comment and share it with us! 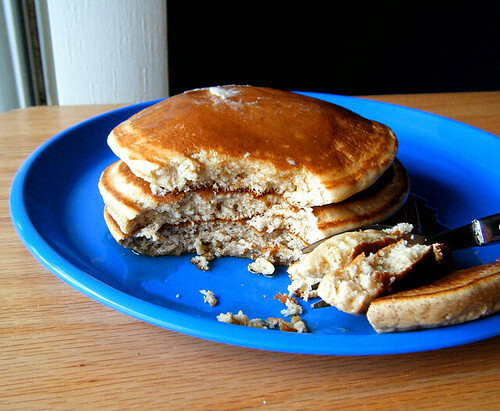 92 Comments on Fluffy, Diner-Style Healthy Pancakes… Low Carb and Gluten-Free! I'm so happy I found your blog through tastespotting! I'm paying attention to what I eat (no sugar except for fruits, no flour, etc…), which means that I don't get to eat a lot of the goodies I prepare for the others… Your pancakes look great, I'll be able to eat them guilt free!! Thanks a lot! I found you on TasteSpotting and am writing to say that if you have any photos that aren’t accepted there, I’d love to publish them. Visit my new site (below), it’s a lot of fun! Lauren these look delicious–and the fact that they are healthy makes them that much more amazing! I can't wait to try this out once summer session madness is over!! You had me at "low carb"! I've been living the low-carb lifestyle for 5 years now and I've never felt better, that's why I'm always excited to find new recipes and idea to add to the repertoire. I'm glad to have found your blog! Those look so pillowy and delicious! do you think the oat flour could be replaced with protein powder, or maybe protein powder with a tiny bit of coconut flour? Thank you so much for this recipe. I, too, have also been fighting an immense weekly craving for pancakes. This recipe comes right in the nick of time. I've been making my own greek yogurt lately – easy, yummy and so economical – so may try using the leftover whey in place of water in the recipe. OOh Lauren! You are killing me with these great coconut flour recipes that I love! VIVA PANCAKES! I love them and am always searching for a healthier TASTIER version than the classic "american pancake breakfast" — Thanks so much for sharing! I enjoy your recipes so much, and I will definitely be trying this one THIS week! Those pancakes may be "low carb", but they are not healthy! They are packed with saturated fats from the cream or coconut milk. Who says carbohydrates are bad for you? LOL @ thinking saturated fats are bad for you. Maria, the cook in our house has been reading your blog for some time and tried several of your recipes. Today she made this one and they were awesome. Just like regular pancakes. You can't taste the coconut flour at all and its wonderful that it doesn't have Soy flour, like other pancake recipes we have tried. This one is going in the permanent cookbook. WOW..those ARE some fluffy pancakes!!! Oops, I forgot to mention my favorite healthy breakfast! Right now, that would definitely a huge smoothie, but I also love to whip up oat waffles. Great recipe! I have a coconut pancakes recipe, but haven't thought to use oat flour. I'll have to look for that – can't wait to try this. Those panackes look like full, fat IHOP pancakes and that's a compliment! I'm literally drooling! Thanks so much for the nice comment about my little apple dumplings. They WERE really yummy! The Maple Grove Farms product does contain Splenda, but it's the fifth ingredient down, while the second ingredient is Sorbitol – which is really problematic for many people, almost as bad as maltitol. I haven't yet found an acceptable maple syrup substitute. I tried the DaVinci product, but it was incredibly bitter, and it burned my tongue. If you have another suggestion, I'd welcome it! Oh my gosh, these look soooo good! I never would have thought to make gf oats into flour -so smart! Loving the healthy pancakes! Looks so fluffy! Yummy, I'm eating these right now as I write this. They are nice and fluffy but yet substantial, a nice change from making Oopsie Roll Pancakes. I doubled the recipe but it was more filling than I thought and I have two pancakes leftover…I'm thinking McGriddle sandwiches for lunch! Mmmm. Thanks Lauren. You're inspiring. I've made many of your recipes and they are always good. These are amaaazing! I made them this morning using coconut milk and half erythritol and half trehalose(healthy sweetener). They didn't turn out as fluffy as the ones in your picture but taste sooo good. Here's a picture i took. I added some shredded coconut, macadamia nut and sliced banana on top, a tropical twist for an already perfect pancake. It's still low carb in my book. Thanks for the recipe and i'm so glad to have found your treasure of a site. Cheers! Fantasticly fluffy! Never knew pancakes could be low-carb, awesome recipe. I love using almond meal, it almost gives baked goods (pancakes included) a yummy buttery flavor, minus the butter! It's awesome. Thank you so much for these! I made them last week for my DH as he has been craving pancakes since we started Atkins (tried a pork rind recipe…ok, but not great). These were wonderful. I won't be making them often as they are still on the high side of carbs since we are still in the weightloss phase of our eating plan – but they will definitely go in my "keeper" file! Plus, my niece is going to start treatment for yeast overgrowth next week and this will be a blessing to her as pancakes are one of her favorites! Thank you for sharing your talents with us!!! FYI – Nature's Hollow makes sugar free syrups (maple & raspberry) with xylitol. There are several places online to purchse including netrition and emerald forest. Just found your blog, whoa! Some great recipes I can't wait to try! Thanks for sharing, and the link to Iherb!!! Wow, Lauren these look fantastic, light, fluffy and delish! You do such a great job making your pictures look "to live for!" I look forward to trying them as a special sunday treat sometime! Sounds great with bacon or sausage, eggs, and some berries on top. I love reading your blog and looking at the yummy pix! Oh, one of my favorite breakfasts: an omelet or scrambled eggs w/herbs, bacon, blanched broccoli or mixed vegetables, and a bowl of blueberries or sliced strawberries topped with raw coconut butter. Hard to pick a single morning meal, I have so many foods I love. Hi Lauren, I just found this blog yesterday and have been glued to it, reading each entry. You do amazing work. I've stopped eating all sugar and refined flours, all processed foods, etc. for about three weeks. And I feel amazing. Thanks to you and your blog I think I'll really be able to make it permanent. As soon as I can track down some coconut flour I'll be cooking up a storm. THese were great. 5 year old DS doesn't love coconut flour in various low carb goodies, but these (plus butter and some real maple syrup) passed his test. 2.5 year old DD had hers w/ just butter, as did I. I split the recipe among the three of us…one bigger pancake for me and two smaller ones for them. Nice to have another option once in a while! Thanks again, Lauren. You truly make it so much easier for us to keep up with the low carb lifestyle. Melanie – I hope you enjoy the sugar-free recipes! Try the pancakes and lemme know how you like them. ew – No, you cannot taste the coconut! Give these a shot. Shilpa – Thanks for stopping by, girl! I'll definitely make these for you. Alisa – They are fluffy! Give 'em a shot. Jennifer – You can't even tell these have coconut flour in them. 🙂 Enjoy! Ms V – The oat flour is pretty essential for the right texture in these. If you try them with modifications, please share how they work out! 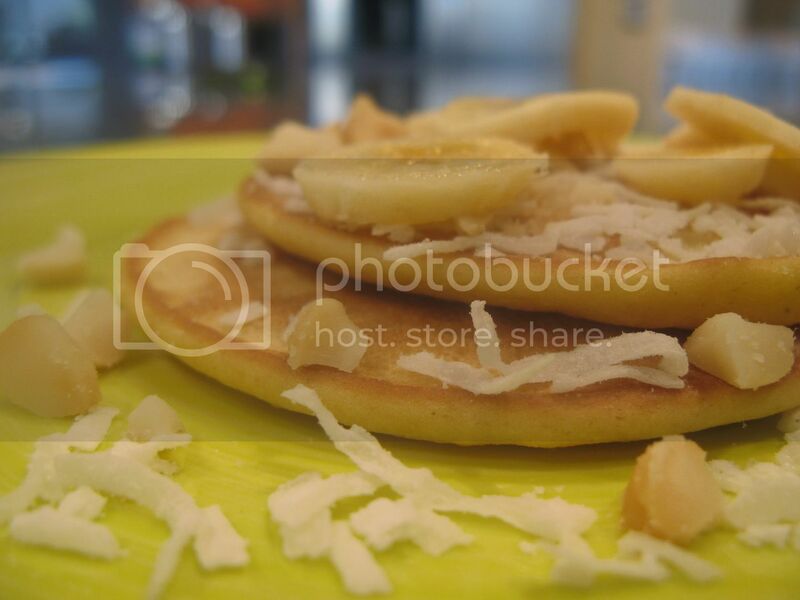 BkBabe – Please share how you like the pancakes if you try them with whey! Bet your yogurt is fabulous. I'd love to see your method for making it! Meagan – Let me know how these work out if you try them! Viva la pancakes is right, yum. GuusVR – Please see the links to the left of my blog content for answers your health questions about saturated fats. Basically, as long as you keep your carbs low, you're good with the sat fats! Rachel – I am SO glad you've tried these and enjoyed 'em. Say thanks for Maria for me, haha! Leslie – Thanks! Omelets are a staple for me, too. Comfybelly – Hope you enjoy the pancakes! Lisamichele – They are better than IHOP, haha! Thanks for stopping by. Anon – Did you try the Maple Grove Farms product and have a bad experience? The amount of sorbitol it has per 1/4 cup serving does not seem to bother me. I will work on a syrup alternative for you using erythritol. Kimberly – Thank you for the heads up! Let me know how these pancakes work out for you. Kelly – Can't go wrong with fruit and almond milk! Sounds like a refreshing summer meal. Thank you for stopping by! 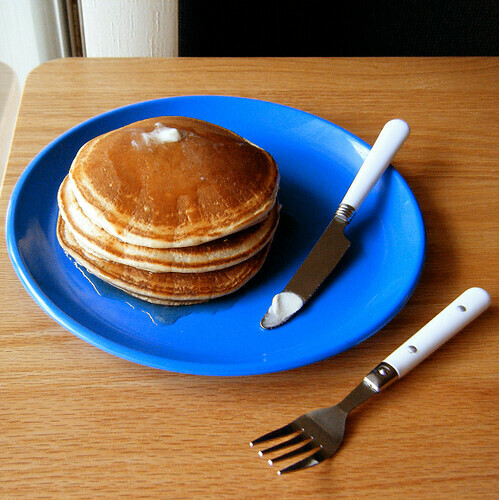 Gwuinifer – Pancakes for dinner sounds great to me! I will be checking out your curd recipe. Good to see you around again! Cara – Thank you for linking me to the protein pancake recipe! I will definitely be checking that out. Venus – You're welcome! Hope you get to try 'em. Chet – Thanks so much for sharing your success with the pancakes! And for taking a photo–always appreciated! Bet they were even better with the fruit. Sophie – Thanks for stopping by! Almond meal is so yummy. Anon – Thanks for sharing the link to that product! It looks great. I do wonder if it contains maltitol though–can't handle that stuff! Bonnie – Glad the pancakes worked well for y'all! I wish you success with the weight loss phase of your plan. 🙂 Hope your niece enjoys these, too! Thanks for the tip about the syrups. Scale Junkie – Thank you for the nice comment! Chef Rachel – Thank you so much! I always appreciate your thoughtful comments. Hope you get to try these! I'll have to track down that coconut butter you mentioned. Tricina – I really hope you were able to find that coconut flour! Best of luck with your chosen eating plan. Let me know how you like the recipes you end up trying! A la ganache – Thank you! BethinNC – So glad the family liked the pancakes. Bet the butter and real maple syrup took them over the top! I always appreciate your feedback. These are the bestest ever! These pancakes are fantabulous. If I hadn't tried them myself, I would never have believed it. Your recipes are amazing. I'm on mission to try them all. Thank you especially for avoiding gluten and soy–it's wonderful to find a pro WAPF low-carver. If you did a cookbook, I would be first in line to buy it. Looking toward to new posts! Cool article as for me. I'd like to read something more about this topic. Thank you for giving this data. I just tried these pancakes and they were PERFECT! I'm on a very strict diet and have tried many pancake recipes, but they were dense and had funny flavors, but not these! They were just as good or better than the gluten ones and they are healthy. My favorite pancake recipe used to be with a bunch of white starches, not good. I am not supposed to have grain, but I splurged for these. Oh my soul, spectacular!!! Just tried these for the first time and they are just as good as my old standy, Krusteaz. Thanks for the site. I have tried many of your recipes and they never fail!!! Would buckwheat be an acceptable sub. for oat flour? I live in a teeny town and any speciality flours I have to travel to buy. I wonder, though, because every single GF pancake recipe has turned out flat and tough, regardless of what went into it. This actually tastes great. 🙂 Love your recipes! This would be great for our breakfast party. Thanks for sharing. 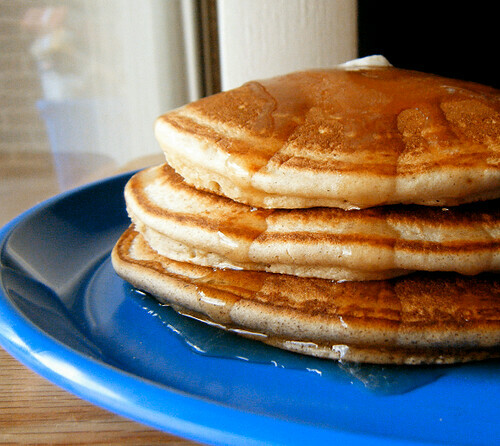 These pancakes just look so delicious. I really like your blog. I’ve been eating low carb on the Atkins way of living for the past 5 years or so. After I started the diet, I really enjoyed the extra energy I have while eating low carb and it has increased my blood chemistry as well! I’m very thankful to Dr. Atkins. I would really recommend it to anyone looking to adopt a new healthy way of living. If you're looking to buy best protein powder (or related protein products) but not sure what to look for, this free expert-nutrition tutorial can help. Looks and sounds yummy!gonna try right away! Thank you so much for this recipe. I used coconut milk instead of the cream and followed everything exactly (except I'm too lazy to sift flours ;)) and it was INCREDIBLE! Scrumptious! I'm scheming a way to make them into chocolate chip chocolate pancakes that I used to have at IHOP as a child…. Thank you very much for giving me this chance and writing such an interesting blog. Good recipes. These look awesome! Can't wait to make them. You should give this healthy recipe a try! If you follow the scientists, the last ten years have found that actually st fats are very good for you. Substituted almond meal for coconut flour as I am allergic to flour and vanilla yoghurt instead of cream as I am lactose intolerant. Great that that are wheat free already! I did use oat bran because I didn't have oat flour, but still tasted amazing. LOVE these! Not only are they not bad for you, they actually contain some good essential nutrients too! Nothing better than a pancake that's good for you. Ok, had an error when I posted first comment, will try this again. Thank you for this fantastic recipe. These taste better than regular pancakes. I spread some Olivio Coconut Spread (tastes like butter and sooooo good) and a little sugar free strawberry jam..one word, Heaven! I made these this morning and my batter was super thin and watery and never thickened up even after letting it sit. You list water in the ingredient list, but then you don’t mention it in the directions. I added 3 tablesoons of water since I used coconut milk instead of heavy cream. I tried making a pancake and it came out extremely thin and flat. Was I wasn’t supposed to add water? Also, I used the refrigerated coconut milk “beverage” from Trader Joes instead of coconut milk from the can. Could that be part of the problem? Latia, the coconut milk beverage will not work. It has been thinned out, so it is watery and does not contain enough fat to stiffen the batter. since when eggs are healthy? They are full of chemicals most of the time. Max, there are many wonderful vegan blogs with great recipes. I hope you are able to find some that fit with your eating plan. Thank you so much for this recipe! I am low carb, gluten-free, and I have usually hated all of the gluten-free pancakes I’ve had. These really hit the spot! I’m also pregnant and woke up today craving pancakes. Thank God I found your website and these pancakes! I am a happy pregnant lady! Hi, Sonya! Glad to hear that the g-free pancakes hit the spot. Sometimes you gotta try a lot of disappointing recipes to find a good one. 😉 Congrats on the baby! Do you mind if I use your nice remarks as a testimonial? I’m shooting you an email. How many total carbs are in this recipe? Did you use a non-stick tefal pan, or a non-stick ceramic pan? Hi, Cathy! I used a non-stick ceramic pan. Been making these for years, and recently discovered they make fantastic waffles. We also add variety: fresh blueberries, frozen raspberries, bananas and walnut, etc. While I love this website and the ebook, this recipe is the most useful (so far). Where is the 3.5 tabl water used? It is in point of fact a great annd helpful piece off information. I am lad that you shared this useful info with us. Please stfay us informed like this. Thanks for sharing. These topics are so couisnfng but this helped me get the job done. This “free sharing” of intomrafion seems too good to be true. Like communism. Yep, Hillary has only known Obozo was not eligible for years now. Maybe she has decided it IS her turn now, and is dropping a hint that she's coming after the usurper?I've noticed she is wearing a different, (younger looking?) hairstyle, and Bill has more or less shut up for the last few weeks.Don't you know Bill would love being back in the White House, relaxing with a good cigar. My blogposts since march 11 are being ignored by google blogsearch, the only reason I can think of is the fact that i merged my previous feeder feed at the time.Someone has any advice on how this problem can be fixed? Keep up the great piece of work, I read few blog posts on this website and I think that your web blog is real interesting and has circles of fantastic info .